Leave the laundry to us. Our brand new equipment gets any size load of laundry done in less than 1 hour. Are you a growing or established small business with sheets , linens, towels or other laundry needs? We can provide superior service so you can do more of what you do best. Family owned and operated since 2013. 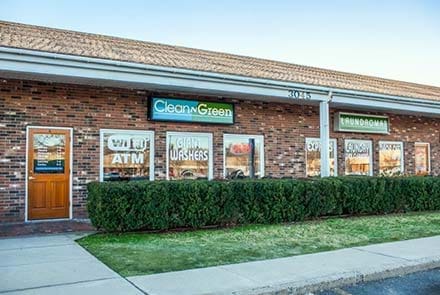 At Clean N Green Laundromat, our mission is to provide the best possible experience for our customers every single time they come to our store. Cleanliness, time/cost/resource savings, a friendly/safe environment and great customer service are what we’re all about. "Best laundromat, and laundry service in town! Will always come here to do my laundry. Great service and friendly staff!" My husband and I love going to do our laundry at clean n’ green. The facility is always kept very clean, as we have a 1 year old that love to crawl around and push the laundry carts. The service is also great. The staff is very knowledgeable and helpful. This place makes doing laundry a more bearable task. I get the wash, dry and fold service here and it is always the way I like it. I am a busy professional with multiple businesses so I needed to find a quality laundry mat. Clean and Green makes my life easier. I went for the first time today and used their wash and fold service. Same day turnaround, friendly staff and the clothes turned out great. Will definitely be back! The nicest laundromat - clean and friendly and the machines all work really well. A great place to catch up on laundry while letting the kids play. Clean. Friendly. Top notch.